More than 1,500 allotment plots in London have disappeared in the past decade - a total area equal to the size of more than 50 football pitches. The findings have been revealed in the 'A Lot To Lose' report from the London Assembly's Environment Committee. More than 4,300 Londoners are also languishing on allotment waiting lists - 3,000 more than a decade ago. The study recommends that developers of high density housing allocate a portion of land for new allotment sites. The report says building at high density, neglect and disuse are the main reasons for the decline in the number of available plots. But demand for plots has never been higher according to the survey. An "unprecedented interest" in organic food has led to more interest in allotment gardening, particularly among women and young families. But the report found there was a lack of information about where plots are and huge variations in supply and demand in different parts of London. 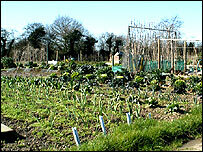 Researchers recommend that boroughs share more information about the allotments they have, and look at ways of increasing supply. Peter Hulme Cross from the Environment Committee said: "Allotments bring so many benefits, including strong social networks, the health and financial advantages of growing fresh produce and a real sense of community." "It is essential that action is taken to protect them."